Sin Sin Man’s passion is to transform raw materials into beautiful things, elevating them into art that we should surround ourselves with in our daily life. Art, for her, is a way to live; to communicate without words in expressing our authentic selves. Over the past decades, Sin Sin Man has created many things as her inspiration knows no boundaries. Her particular love for textile and three-dimensional shapes results in elegant silhouettes with unexpected details that make up her signature style..
A free-spirited and hands-on artist, Sin Sin Man frequently travels across the globe. She loves to explore, collaborate with and contribute to the local traditional crafts, art and culture. She explored many parts of Asia, where she continues to work alongside traditional craftspeople in remote studios in Indonesia, Cambodia, Laos, Nepal and Mongolia. These experiences she incorporates in her own design by using traditional textile, paintings and craft techniques – with a contemporary twist. Sin Sin Man has also collaborated with contemporary visual artists on textiles, jewellery and environments. In 1998, Sin Sin Man fell in love with a four-storey building from the 1930’s in On Lan Street, Central, Hong Kong, where set up her own atelier. A new chapter of her life has begun where she started to create purely to express her very own vision of reaching balance through art and beauty. Apart from showcasing her own work, which takes shape in the form of wearable art, Sin Sin Atelier became also a platform for creative minds from all over the world. The Atelier is an art and design environment where Sin Sin Man develops and communicates her belief that art should be present in every aspect of our lives, from things we wear to spaces we inhabit. At the same time, Sin Sin Man built three state of the art villas in Bali to create a well-balanced life between the hustle and bustle of Hong Kong, and the contemplative quiet in Bali. The villas are set amongst the lush paddy fields and given meticulous attention to aesthetic details: from breathtaking architecture and gardens with swimming pools, to the eclectic choice of furniture, inspiring artworks, flower arrangements and meals. During her frequent visits to Indonesia, Sin Sin Man came to know the work of Indonesian contemporary artists - which inspired her to establish Sin Sin Fine Art in 2003. 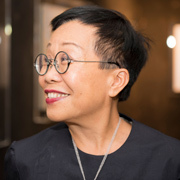 Since then, she has worked with more than 40 artists and curated more than a hundred art exhibitions - showing artworks from many parts of Asia, Europe and the US. Her opening night events are legendary. After over a decade of committing herself to settle down in Hong Kong, Sin Sin Man is now ready to start the next chapter: to go out and explore new challenges. Lately, Sin Sin Man has also conceived sculptures and installations using natural materials, incorporating traditional techniques that she blends with her unique sensibility. In her hands, tradition becomes sensuous and intimate within a contemporary framework whereas the transformative capacity of the materials enchants a life caught in transition. Sin Sin Man just lets the sources of her creative life unfold in front of the viewers’ eyes and hopes they will be captivated as she always has been.